This title is almost out-of-print. The Delaware & Hudson, the Boston & Maine and Maine Central were some of a small group of United States railroads unchanged in the 1970s during a time of mergers and bankruptcies. These railroads represented some of the oldest names in railroading. This book is about the last decade of these three railroads before acquisition by Guilford Transportation Industries. 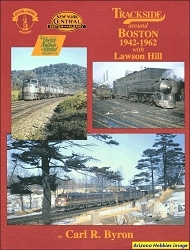 These three were colorful railroads and this book is all Color photography with the addition of maps timetable reproductions. You will see Baldwin Sharks on the D&H, Alcos on all three plus GE and EMD locomotives in a variety of paint schemes. Old Line Graphics, hardcover, 128 pages, 8.5 x 11 x .5 in., all Color photographs, rosters, timetables, maps.